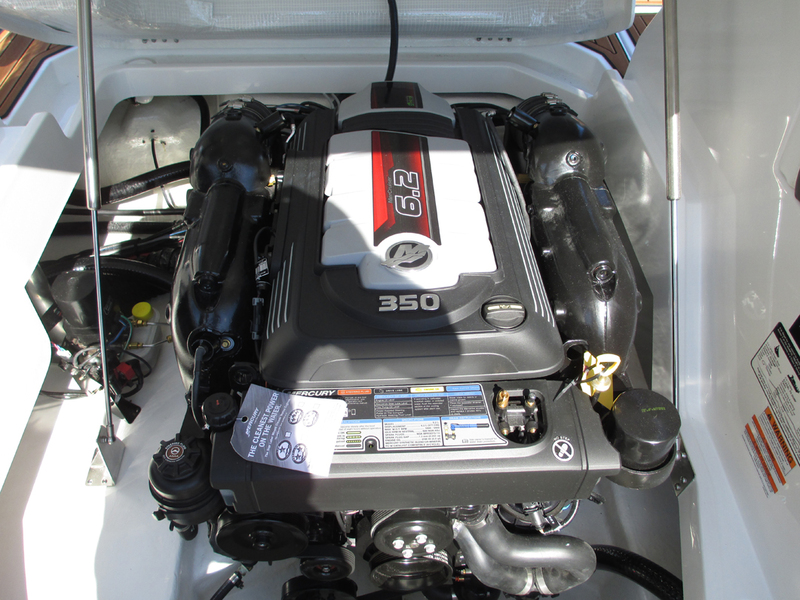 Big new outboard, sterndrive and water-jet engines have been in the marine power news over the past couple of years and the test team at Boats&Places and PowerBoat Television has been able to experience them out on the water. First: the outboards. When fish, fun and speed all intersect, powerful things can happen. In the world of marine power, big outboards have been happening. Lately, they’ve been the darlings of the fishing, pontoon and go-fast world. Both Suzuki and Yamaha have had, respectively, 300- and 350-hp four strokes in their lineups for a few years. 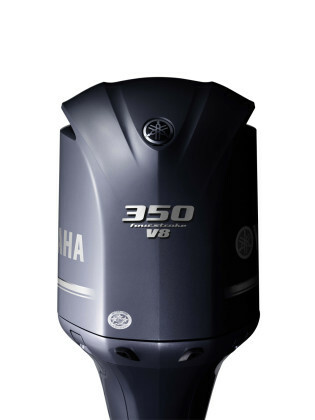 Yamaha introduced its F350 5.3 L V-8 outboard back in 2007 for the 2008 model year, while Suzuki’s DF 300 V-6 was new for 2011. 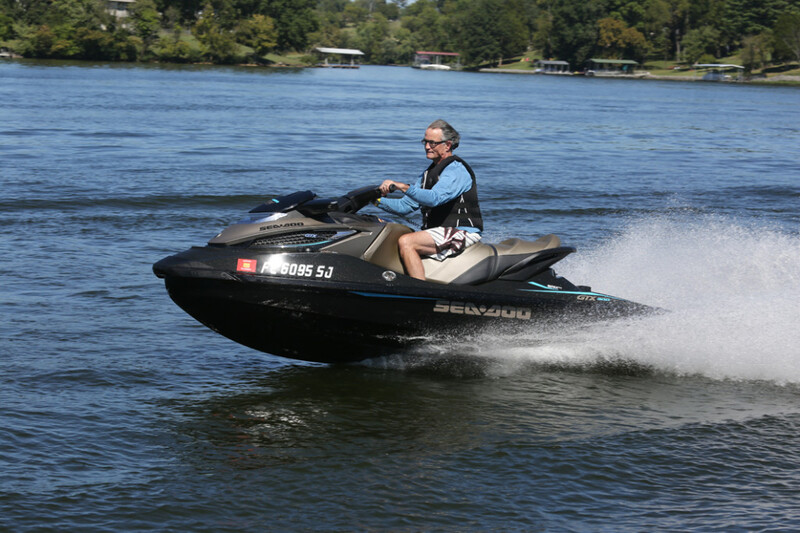 Honda, a four-stroke pioneer, launched its flagship BF250 outboard, a 3.6 L V-6, for the 2012 model year. 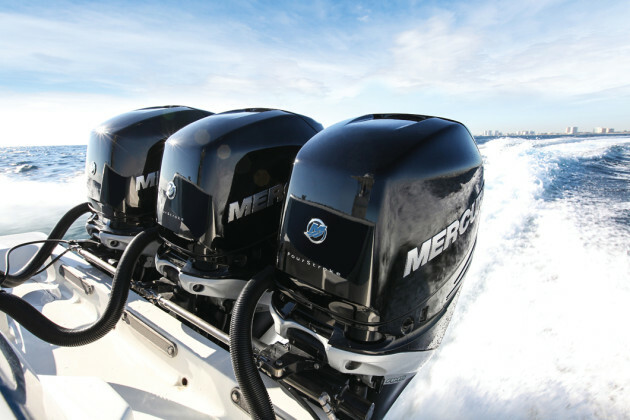 It was Mercury’s turn to step up to the plate for 2016, introducing the super-sized supercharged four-stroke Mercury Racing Verado 400R at last winter’s Miami International Boat Show. 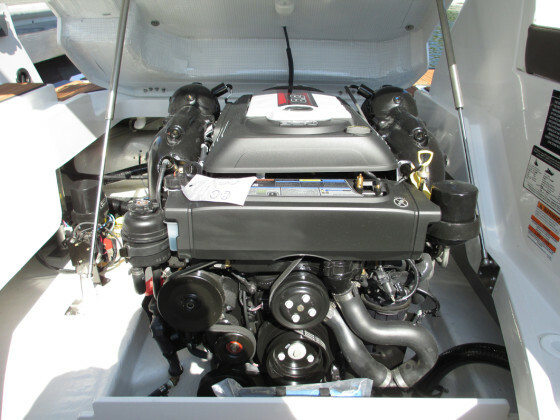 It is possible that the presence of niche monster outboard-builder Seven Marine, just down the road from Merc’s headquarters in Fond du Lac, Wisconsin, may have nudged Mercury Racing to wring 50 extra horsepower out of the inline six-cylinder 2.6 L Verado block. 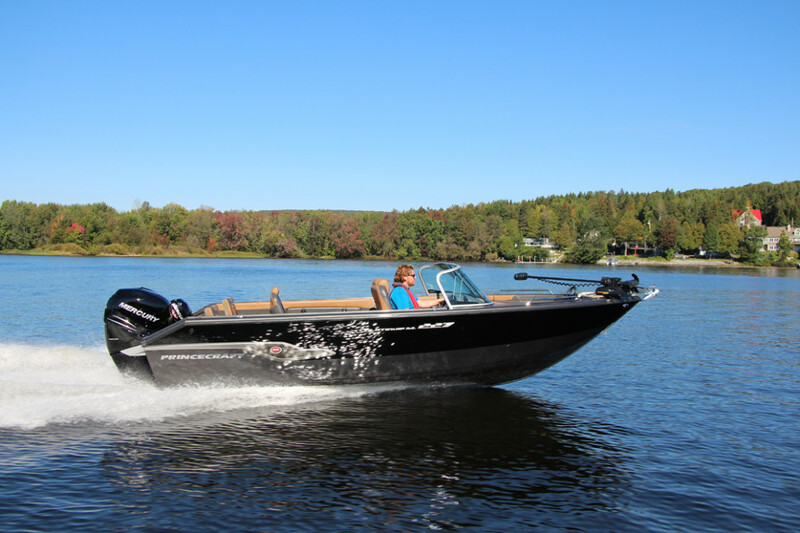 Merc certainly would have done it on its own, of course, but the presence of Seven Marine in nearby Germantown, Wisconsin – headed by an ex-Merc engineer and building 557-hp and 627-hp 6.2 L V-8 outboards – may have hurried things along. As it is, the Verado 400R puts out 153 hp per litre of displacement, thanks in part to a custom cold-air induction system and a new water-cooled supercharger. 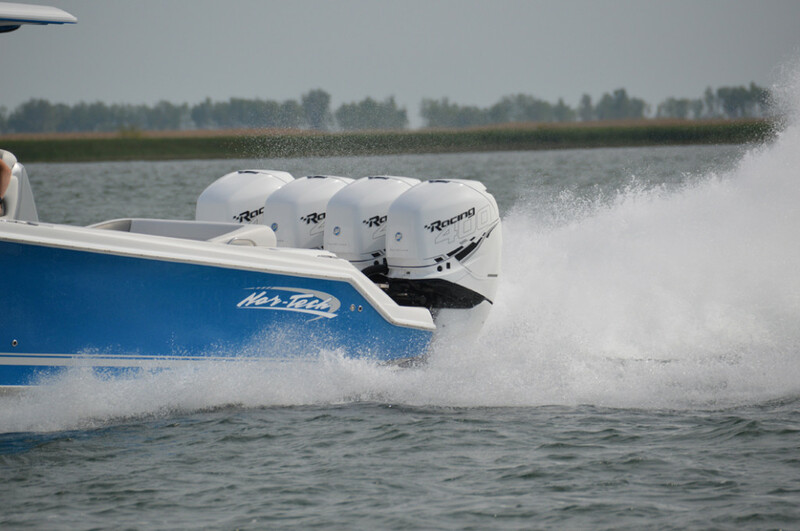 That means it can rightfully claim bragging rights for the highest power-to-weight ratio of any of the big outboards – including the one built by those guys down the road. 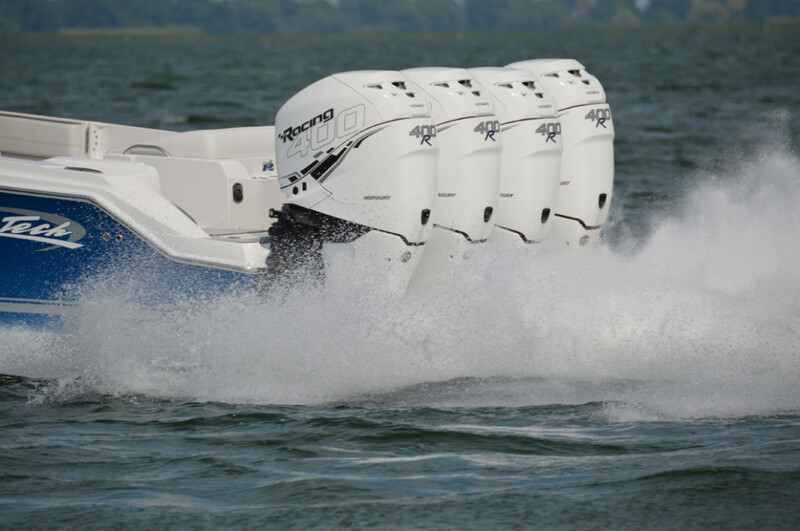 As Steve Bull outlined in his Mercury Racing feature, PowerBoat TV host Mike Gridley got to experience the new 400R in person, four of them actually, on the transom of a Nor-Tech 390 Centre Console last summer. The Nor-Tech’s owner, says Gridley, had the boat propped for maximum speed, so the stepped-hull Nor-Tech was topping out at about 94 mph, even with a hard T-top in place. The 400R has been built for speed, the only Verado available with Merc’s race-proven Sport Master gearcase, with low water pickups. Gridley says beefed-up mounts and over-sized tie-rods on the rigging were added to harness the extra power. The engine’s 25-inch-centre mounts, says Gridley, also mean the new engines will be easy to swap in for older models. Steve Bull, co-host of PowerBoat TV, saw top speed for the day in the Nor-Tech 4000 Roadster catamaran “chase boat,” whose twin 1100-hp Merc Racing sterndrives pushed it to what Bull calls a “mind-blowing” 135 mph. For what is supposed to be a relatively mild-mannered offshore fishing boat, he says, the Nor-Tech with quad 400R engines was impressive. Bull drove a boat rigged with a single 350-hp recreational version of that engine later last summer. The Mercury Verado 350 was on the transom of a Princecraft SE 227 fishing boat and gave Bull a GPS-verified top speed of 60.9 mph. He says the boat is a likeable and smooth-riding mélange of tournament fishing boat and all-round cottage and day-cruiser, complete with plenty of storage space, livewells fore and aft, and a heated helm seat. 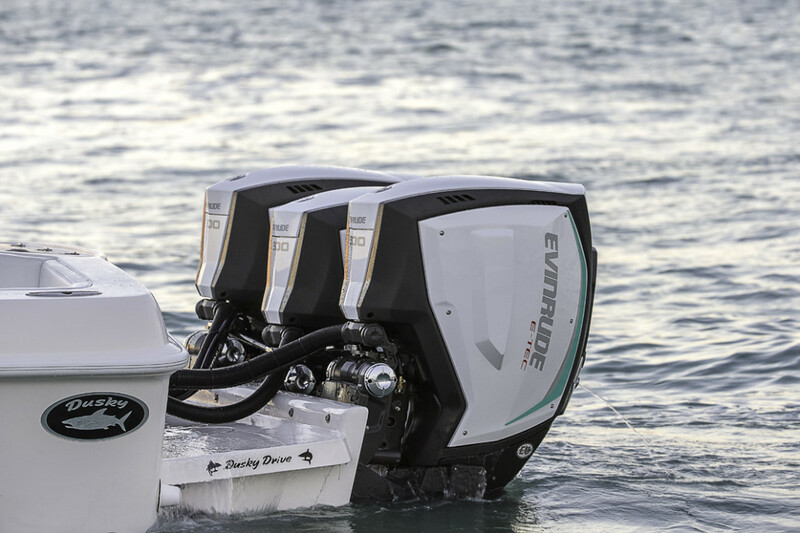 Another range of new high-horsepower outboards, launched in 2014, are the direct-injected two-stroke Evinrude E-TEC G2 3.4 L engines, from 200 to 300 hp. 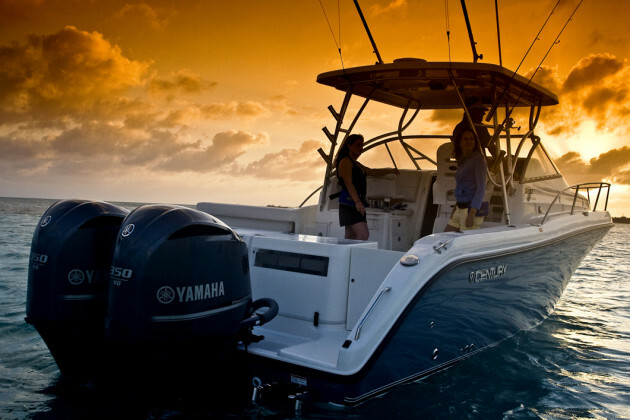 The Evinrude E-TEC 300 has a power-to-weight ratio better than both the Verado 300 and 350, but also profits from the inherently fat torque curve that comes with two-stroke engines. 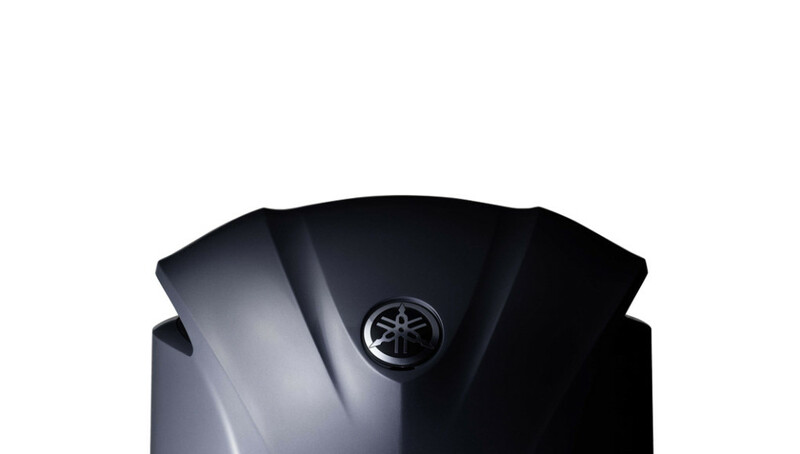 Particularly in twin or multiple installations, with the right propellers, that translates into powerful acceleration. On different occasions, both Bull and Gridley rode a Premier Grand Entertainer 29 pontoon equipped with a full bar and luxurious lounges, but powered by a pair of Evinrude E-TEC G2 300 outboards. 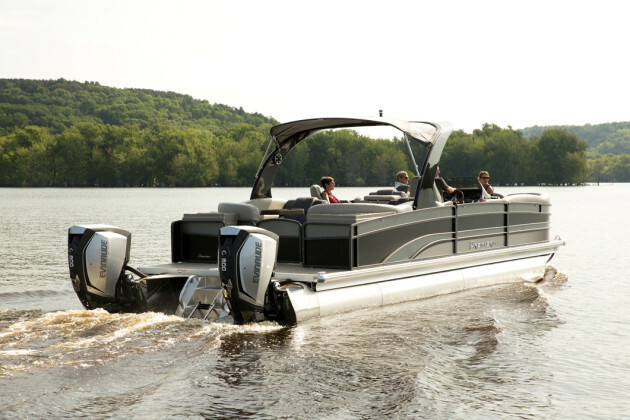 Pontoons don’t always bring to mind speed and acceleration, but the Premier, equipped with a top-performing PTX hull was a real performer. They experienced the engines’ great hole shot and mid-range power. Sterndrives still have a big place on the recreational waterfront, and both Volvo Penta and Mercury Marine have been releasing new-tech models recently. Volvo Penta rolled out V8-350 and V8-380 versions of its 6.0 L sterndrive a couple of years ago and launched new 300- and 350-hp versions of its 5.4 L V-8 last summer. 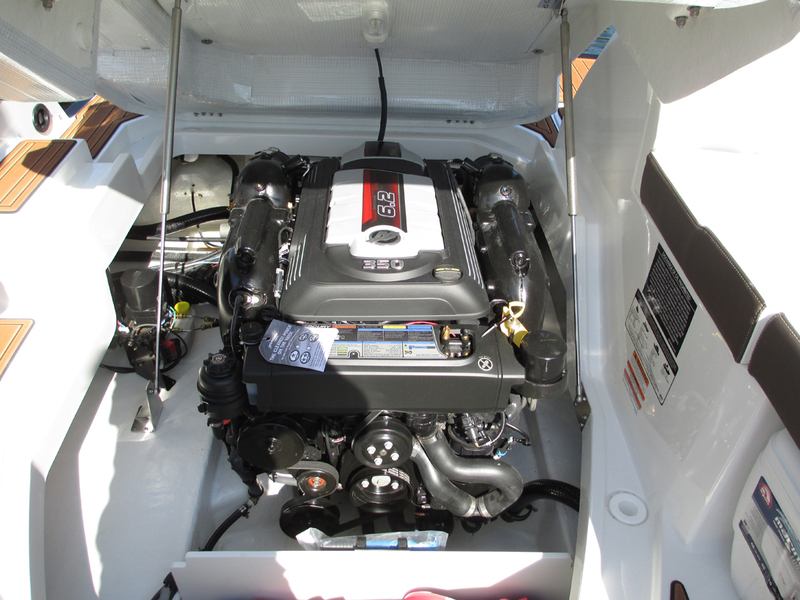 We were able to take a much closer look at Mercury’s new MerCruiser 6.2 L V-8 last summer. Gridley was on hand for the launch of the new MerCruiser 6.2 L sterndrive, for boat testing – a segment that is also part of this year’s PBTV lineup. The MerCruiser 6.2 L, in 300- and 350-hp versions, is a purpose-built marine engine, not a marinized automotive powerplant used in Volvo Penta’s sterndrives. So, like the new 4.5 L V-6 MerCruisers introduced for 2015, the 6.2 L V-8 has built-in corrosion resistance and the convenient maintenance features that will make it very easy to live with. “Everything you need to touch and see or fill is front and centre,” says Gridley, even including a drain system that helps boaters stretch the season into early spring and late fall. It’s all part of Mercury’s commitment to making boating as easy and stress-free as possible. Adaptive Speed Control, that automatically maintains a set rpm point regardless of load condition – such as tight turns, is another convenient feature of the 6.2 L. Also, versions of the engine with digital throttle and steering are ready for optional Axius Joystick Piloting for Sterndrives, which takes almost all the stress out of docking situations. Other thoughtful changes in engine construction, says Gridley, are larger engine mounts that help reduce vibration and an aft-facing throttle body, “so the air intake isn’t honking in your ear when you are sitting in the back seat. “What you do feel with the motor . . . is its flatter torque and horsepower curve.” Along with weight and friction reductions, that also translates into better fuel efficiency. Personal watercraft enthusiasts also feel the need for speed, so BRP responds this year with its new supercharged 1.6 L 300-hp Rotax 1630 ACE engine. It’s available in three Sea-Doo personal watercrafts: the luxury GTX Limited 300, sporty RXT-X 300 and race-oriented RXP-X 300. ACE stands for Advanced Combustion Efficiency and the technology includes a spherical combustion chamber for more complete fuel/air combustion and friction reduction throughout, to reduce power losses. In the 1630 ACE that also means plasma-coated cylinders that save 2.6 pounds by replacing metal sleeves. The 1630 ACE has a longer stroke for nine percent more displacement, plus more torque in the middle range. A new supercharger wheel helps to increase boost by 30 percent and a beefed-up intercooler means the charge air is cooler and denser. 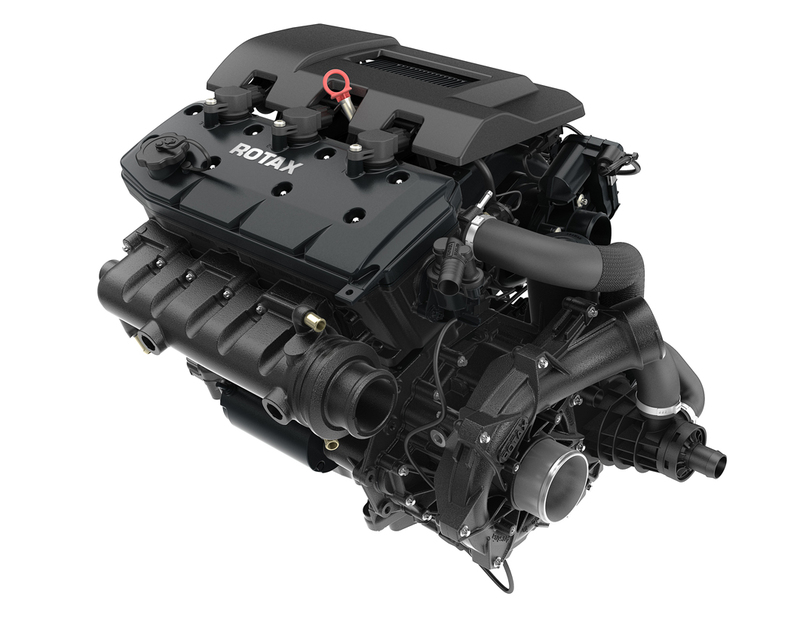 At 100-hp per cylinder, it’s a powerful package. Steve Bull drove the more performance-oriented Sea-Doo RXT-X 300 in a Florida test session last fall and also reports astounding acceleration and speed. “It just pops out of the hole and cruises easily in the high-50s,” he says. 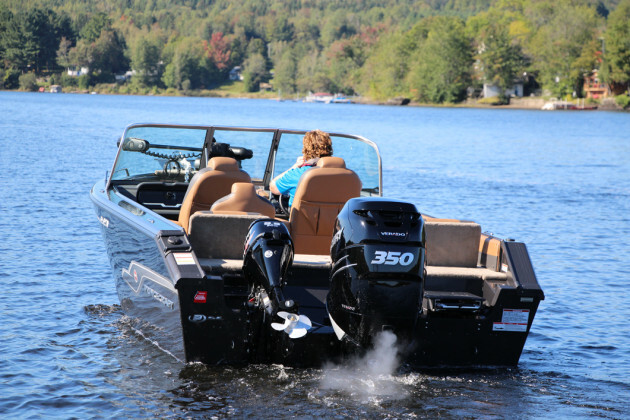 Like many high-horsepower marine engine applications, it may not appeal to masses of boaters for everyday outings, but for those with a taste for high speed, tight handling and performance, it’s a special treat. This article is featured in the Winter 2016 issue of Boats&Places.